Algorithmically enlarge images to high resolution. Is there a better alternative to AKVIS Magnifier Business? 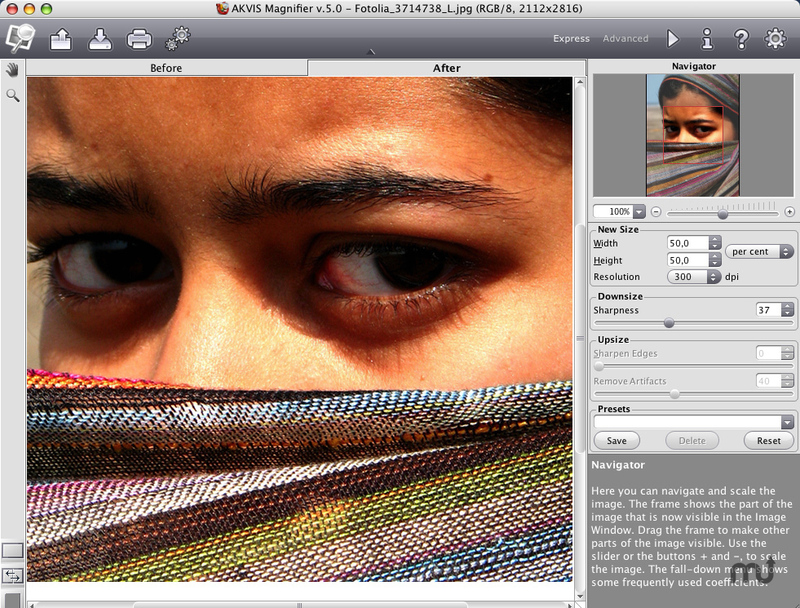 Is AKVIS Magnifier Business really the best app in Image Editing category? Will AKVIS Magnifier Business work good on macOS 10.13.4? Improved the plugin compatibility with image editors (Photoshop CC 2017). Support for new RAW files for the standalone version. AKVIS Magnifier Business needs a review. Be the first to review this app and get the discussion started! AKVIS Magnifier Business allows you to enlarge images to high resolution with sophisticated algorithms. AKVIS Magnifier Business upscales digital images with advanced enlargement algorithms, preserving edge to edge image sharpness while improving image appearance by removing unwanted noise and compression artifacts. Get super-high resolution pictures and produce stunning enlargements and poster-size prints. The sophisticated algorithms keep edges smooth, sharp and clearly defined at the same time. Just take a photo and enlarge it to a super-high resolution of up to 30000x30000 pixels, to print a100x100 inch poster with typographic quality of 300dpi. Larger formats are viewed from the distance, allowing for even larger prints of 200x200 inches a whooping 5x5 meters. AKVIS Magnifier Business makes producing professional enlargements and poster-size prints easy and quick. AKVIS Magnifier Business does not require an external photo editor to operate. The resizing is easily configurable and allows fine-tuning the enlargements by introducing complete user control over important parameters such as image and edge sharpness. All settings can be quickly tried, adjusted and combined by simply clicking and sliding. Resizing pictures with AKVIS Magnifier Business yields a much higher quality than bicubic interpolation. Using complex math based on sophisticated resize algorithms, the resizer outputs enlargements with smooth, sharp and clearly defined edges. Depending on your particular needs, AKVIS Magnifier can be fine-tuned to produce images that look exactly as required for a given purpose. The photo enlarger works great if a modest 1.1x, 2x or 4x enlargement is needed, but it truly shines if used to blow up a photo to 10x or 20x the original size.